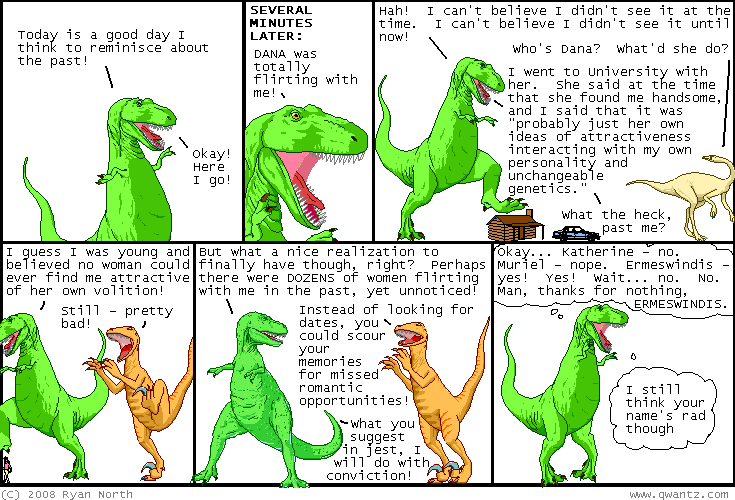 Dinosaur Comics - April 10th, 2008 - awesome fun times! April 10th, 2008: Hey here's a new shirt! It's based on this tattoo comic and if you wanted to try out T-Rex's tattoo in t-shirt form before getting it burned into your skin for all time, then have I got a shirt for you. The image is 8 1/2 x 11 inches, exactly as large as a real sheet of paper! People who see your shirt may experience "cognitive dissonance". One year ago today: um he played "frasier" on "frasier"